A tastefully minimalist modern and pastel hued trio of ultrasonic humidifiers designed by Japanese designer, Kazuya Koike. The Kamome ultrasonic humidifier by Japanese industrial designer Kazuya Koike of Doog Design shares the classic antenna-topped silhouette of an electronic appliance of yore ? the radio. But this little square-shaped home appliance is engineered to output soothing ultra-fine vapor rather than tunes. The ultrasonic humidifier’s square body and chimney design evokes the simplified shape of a tabletop radio in a most minimalist form. Within its spare case hides a high capacity 2.4 liter tank designed to feed distilled water to an ultrasonic vibrating diaphragm to turn into a fine mist for up to 8 hours between refills. There’s also the option to add additional aromas to the mist output using a small separate felt insert compartment if desired, and controls include the ability to set the humidifier for 1, 2, and 4 hour intervals before auto-shut off. Two models are available ? hybrid and ultrasonic ? with the hybrid model offering a heating element to warm the steam before output. 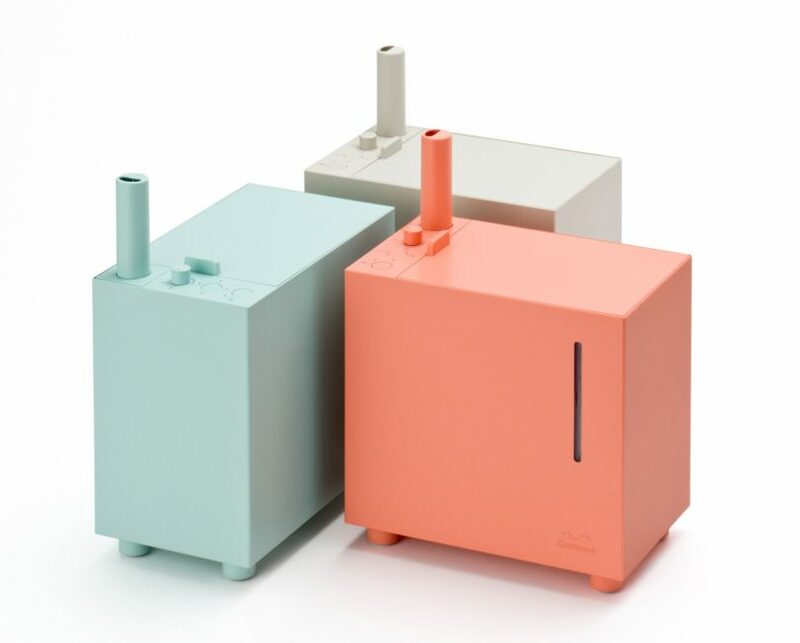 Available in light grey, mint green and coral pink, the Kamome humidifier is designed to be as much as a decorative element as an appliance of comfort and health, another example of tasteful Japanese modern design in the humidifier category designed to complement decor, rather than detract from it.